Images by Harry Leonard Imagery (unless otherwise marked. Did you know 96 African Elephants die every day? At this rate they will be gone in less than 8 years. The demand for ivory is directly correlated to their rapid decline. Just as fashion increases the demand for ivory, it can also be used to slow the slaughter of these beautiful creatures. On Saturday at Vancouver Fashion Week, we were treated to a wonderful runway show called Elephantasia 2016. International designers Anna Fora, Amit Ayalon, Alex S Yu Studio, Brigid Ko, Danny Reinke, Dawson & Deveraux, Devonation, Eria Lamarque, Jacqui Bennet, Katherine Soucie, Kyoko Kondo (gold necklace), Mila Hermanovski and Tatiana Shebelnik have stepped forward to create an elephant inspired collection to raise awareness of this issue and support fundraising efforts. (Note - I have 13 names but saw 14 looks on the runway, so am following up on this). This show had tremendous impact. From the amazing visuals, to well chosen hair/make-up, to the commitment the models made in their walk. the seriousness of the issue came through for all watching. I want to especially mention sound healer/musician Becky Pezely. Her incredible sounds designed to resemble the elephant communication created on Tibetan singing bowls were the perfect addition. My apologies for the poor photo of the musician, but she was tucked in a poorly lit corner where the photographers in the pit could not get a photo, so I had to snap a pic on my little digital. Anna Fora: This look is a composition of two pieces, The Empire Coat and The Empire pant, inspired by the grandeur of the elephant. This look aims to capture the robust and circular lines portrayed by the elephants body, in a manner that regards the animal as a royal and powerful, as interpreted by the Asian and African societies who lived in close quarters with them. 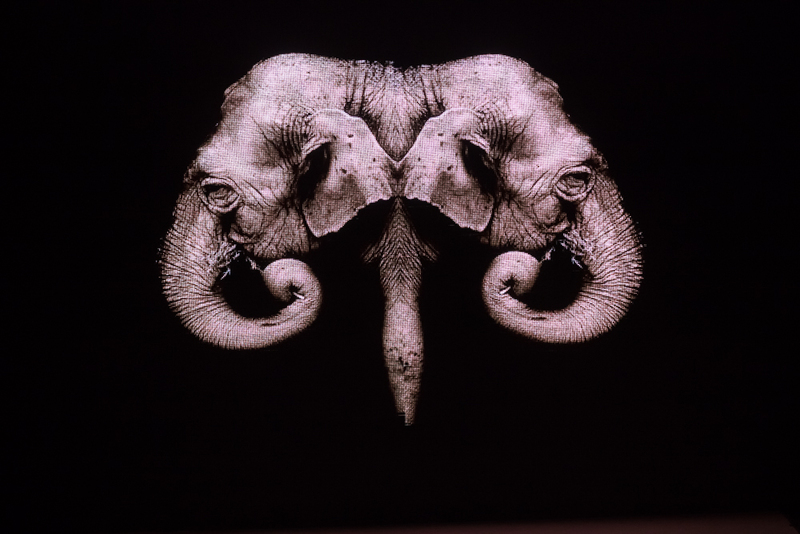 Katherine Soucie: Soucie’s Elephantasia piece “Airvatta,” represents the white elephant which is intricately associated with Buddhism and Hindu cosmology. It is believed to represent peace and prosperity. It also is meant to represent something of little or no value...She has created this piece out of her signature hosiery textile fabric that will be embroidered to resemble the skin of the elephant. The silhouette of the garment will take on the silhouette of the elephant ears with large exaggerated sleeves that will have oversized cuffs that will resemble the trunk of the elephant. Given that hosiery is manufactured to be a second skin, she is replicating the elephant skin texturely in order to for it to embody the spirit of the animal." Alex S Yu - I am inspired by how vulnerable the elephants are in their natural habitats. People hunt/kill them for their own pleasure/materialistic gains in their natural habitats in which they cannot escape. They can't do anything to prevent it in their own powers. I want to convey that feeling of helplessness in my design. The base of the dress is a slightly thicker grey textured fabric cut into a shape that is loose in the arms as inspired by the elephants' ears. The dress is "contoured" with red (blood/violence) straps that can be tightened or loosened with adjustments on the bodice as well as the wrists. The tighter the straps, the more restricted the movements. I feel this conveys the elephants' situations and will generate awareness. Kyoko Kondo - Argenteria ginko - The gold necklace is titled, "Elephant in light and shadow –TWO FACE". Elephants are big, strong, smart, and unique shape, such as a very popular animal, on the other hand, they killed for its ivory unnecessarily. This is the face shining in the light with great ivory and the face in the shadow lost ivory. To express light and shadow, left side has smooth face and shiny ivory with Cubic Zirconia, and right side has textures without ivory. Also each earring has different color of cup chain. It has been designed not too strongly express the form of elephant, good match for any cloths. I’m happy with wearing it. When I touched elephants I thought that their skin feels like crumpled cardboard, so I did it for making the texture. Cut out cardboard in the profile type of elephant, and it is across as edging in two of the brass plate. I received a technical cooperation of handmade accessories designer ucca6. 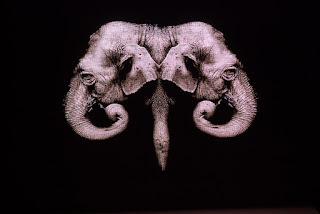 Dawson & Deveraux - This piece by D&D for the Elephantasia campaign was inspired by the imposing beauty and diversity of one of the world's most breathtaking creatures. Created from vegan leather and gold hand embroidered lace (the underlay) meticulous attention was taken to play off the roughness of the skin and infuse an element of movement with the fringe detail in the arms through the bodice. This was the perfect D&D project as we were able to make something referential without being literal while focusing on an area of social responsibility that often goes unnoticed. Brigid Ko - I use primarily recycled materials in my avant-garde and couture designs. This particular piece is created entirely from recycled and reclaimed materials! The top is recycled inner tube, the skirt recycled roofing rubber and recycled leather. And, the neck piece is made from recycled fabric and reclaimed clay. I created 96 handmade clay tusks to represent the 96 Elephants that are killed on average, astonishingly, every day for ivory. I am so honored to be one of the 12 Sustainable designers chosen to help raise awareness funds to expose and protect the African elephant alongside NOVICA of National Geographic and Elephantatics BC. ELEPHANATICS is the only elephant advocacy organization in British Columbia, Canada! Our mission is to help the long-term survival of African and Asian elephants by raising awareness and disseminating information regarding the enormous challenges and suffering elephants face in Africa’s poaching crisis and in Asia’s tourist trade.